Only WDWorld has chosen the Top 10 Disney Dining Plan Restaurants based upon the following criteria: Food Quality, Dining Experience, & Disney Dining Plan Value. Care was also taken to include a mix of restaurants that would appeal to families with children, couples, and large groups. The Disney Dining Plan is the extremely popular pre-paid meal plan that can be added as an option to a Disney World Vacation Package. Once you have decided to get the Disney Dining Plan option your next big decision is where to dine. Currently there are 50 different Table Service Restaurants on the Disney World Property that participate in the Disney Dining Plan and only require 1 Table Service Credit. There are several additional Dining Experiences called Signature Dining Experiences that accept Disney Dining Plan credits, but require 2 Table Service credits per person. For the purpose of our Top 10 we only look at restaurants that require 1 TS credit. Note: Although Le Cellier will only require 1 credit for lunch, it will require 2 TS credits for dinner after 2/28/11 so it will not be included. 10. Crystal Palace – This Buffet earns its way into the Top 10 on the strength of its location in the heart of the Magic Kingdom, and the fact that this is also a Disney Character Dining Experience where you can meet Winnie the Pooh and his friends from the Hundred Acre Woods. The building is very picturesque, tucked away from Main Street near the entrance to Adventureland. The Crystal Palace is open for Breakfast, Lunch, & Dinner, but your best Disney Dining Plan Value is to go for dinner. 9. 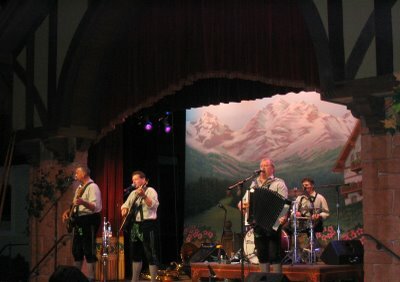 Biergarten – If you have a large group dining in Epcot this is the place for you. It is a festive atmosphere with live entertainment. The food is buffet style with German offerings as well as some American favorites for those less adventurous types. The music and entertainment make this a family favorite. The best word to sum up the experience is "fun." If you enjoy German cuissine then you are in for a real treat. You can also order German beer served in large mugs (extra charge) to fully partake in the Oktoberfest. 8. Chef Mickey's – Every family with young children should visit Chef Mickey’s at least once. Housed in the Contemporary Resort this is your chance to get to see Mickey Mouse himself while dining! The Character Dining Experiences are a great way to get pictures and personal interaction with your favorite characters. Chef Mickey’s is a buffet with American style offerings. Even adults will find themselves twirling their napkins along with the Disney Characters during this fun dining experience. Kids really like the make your own sundae bar along with all of the other desserts. 7. 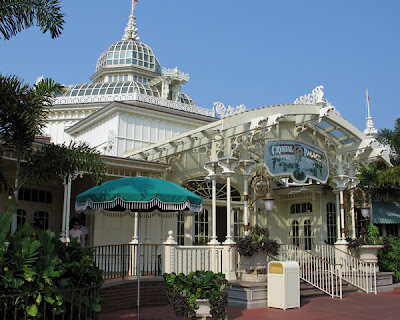 1900 Park Fare – Here is the most economical way to dine with Cinderella! Located at the Grand Floridian Resort, 1900 Park Fare is a buffet where Cinderella, Prince Charming, Lady Tremaine, and the step-sisters are all present. The buffet food is very good, plus you have Cinderella and the location in the Grand Floridian making this a great way to treat “your princess.” You will get more individual time with Cinderella here than if you wait in lines in the parks to see her. 6. San Angel Inn – The inside of the Mexican Pavilion at Epcot provides the beautiful setting for the San Angel Inn alongside the River of Time. This may be one of the most romantic settings for any of the Disney World Restaurants. The lighting is low and the authentic Mexican food is very good. This is one of the best Disney Dining Plan values and is a suitable for families or couples looking for a special dinner. See: San Angel Inn Review with Pictures. 5. Princess Storybook Dinner -at Akershus Royal Banquet Hall – When one princess is not enough, you can dine with several in the Akershus Royal Banquet Hall located in Epcot’s Norway. This is the only character meal that is not a buffet and a photo package is also included, making it a great Disney Dining Plan Value. You may see Belle, Jasmine, Ariel in ball gown, Snow White, Princess Aurora, Mulan, and/or Mary Poppins. Cinderella also makes occasional appearances, but not guaranteed. You will also get a chance to taste authentic Norwegian cuisine. The menu choices include a variety including beef, chicken, seafood, pasta, and more. 4. Tutto Italia – This is currently the best Italian Meal available for 1 Table Service Credit on the Disney Dining plan. Located in the Italy Pavilion of Epcot, this restaurant features a wide selection of authentic Italian entrees and desserts. The inside of the Tutto Italia is busy, but the atmosphere is family friendly. The menu choices are delicious including Pastas, Seafood, and more. The decorations and furnishings inside make you believe that you have been transported to Italy for the evening. Most of the servers are from Italy furthering the experience. 3. 'Ohana – This is Only WDWorld’s #1 choice for a large family or group to dine at Walt Disney World. ‘Ohana is located in the Polynesian Resort with a view of the Magic Kingdom. If you dine late enough, you will be treated to a great view of Wishes. The family style serving of food makes sure that no one goes hungry. The meal is a set menu which speeds up the process. No long wait once you are seated for restless kids. The servers bring skewers of meat to the table is very entertaining and there is additional traditional Polynesian entertainment and a coconut race. The Bread Pudding for Dessert is certainly one of the best in all of Disney World. See: 'Ohana Review with Pictures including Dessert! 2. Coral Reef – If you are looking for a unique dining experience then Coral Reef may be the place for you. It shares a glass wall with the main tank of the Living Seas attraction providing a continuous stream of aquatic life swimming by while you dine. The atmosphere is quiet and suits either a family or a couple looking for a romantic night out. They have excellent seafood and steak on the menu and tasty desserts to choose from. The Chocolate Wave may be the best Disney dessert for chocolate lovers. See: Coral Reef Review with pictures. 1. Chefs de France – Located in the France Pavilion of Epcot, Chefs de France takes the 2010 title as "Best Disney Dining Plan Restaurant." It receives this title by having incredible service, great food, wonderful ambiance, and a great Disney Dining Plan Value for only 1 Table service Credit. There are menu choices to fit the seafood lover and those that prefer beef, chicken, or even duck. They even have vegetarian choices. The service here is top notch and certainly rates amongst the highest in Disney World. The restaurant was started by a trio of renowned French Chefs and they keep the quality of food and the dining experience at a high level. Even if you do not think you like French Cuisine there is something here that will appeal to you. See: Chefs de France Review with Pictures. Sidenote: There are many other wonderful restaurants at Disney World in addition to those in the Top 10. One driving factor in the selection of the above Restaurants is that they must be a good value for your Disney Dining Plan Table Service Credit. With the Disney Dining Plan you are paying approximately $30 for each table service credit. That being said, you want to make sure that you are getting good value with the use of that credit or you are better off just paying cash for that meal. 3 comments to "Top 10 Disney Dining Plan Restaurants"
Im on the dining plan for our next trip and really looking forward to the San Angel Inn, Ive gone past it in the mexico boat sooooo many times :-( May here I come! My family and I ate at San Angel about 10 years ago. The food was so good and so vast, we ate around 7:00, then went back to the hotel and passed out, comatose!